Nellie McClung made an indelible mark on Canada. She was the author of eighteen books, a political activist and social reformer. In every role she played, she demonstrated unfailing courage, wit and resourcefulness, and helped make a better world for women and girls. 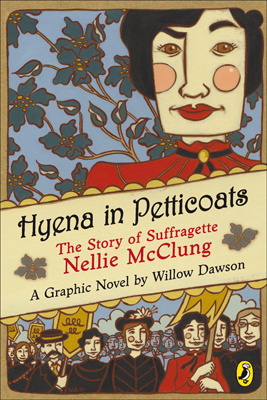 In the first frames of this brilliant graphic biography, Willow Dawson plunges readers into the rugged world of Canada’s western pioneers, taking us into the early life of McClung as the child of homesteaders, and follows her on her path to becoming a teacher, a crusader, a suffragette and eventually the first female Member of Parliament. Willow Dawson grew up in Vancouver and now resides in Toronto with her husband Ray Cammaert. She graduated with honours from the Ontario College of Art and Design and works as an illustrator and cartoonist for various clients, including YWCA Canada, Owl Magazine, Kids Can Press, Top Shelf Comics, Filmblanc, Shameless Magazine, Sumach Press, Kiss Machine, Strange Horizons, and Tightrope Books. This entry was posted in 2011 Releases, Comics For Kids by Kevin A. Boyd. Bookmark the permalink.